Best time of the year hands down. Fall. The nights are cool, the days are warm, the sky seems a little more blue, and the beer is amazing. There is a misconception about this time of year though – that it is time to put the grill away for the winter. Put the grill away? Why would anyone do that? Perhaps it is because you don’t have a cover to keep the snow off of it. Maybe you do have a grill cover but it has more holes in it than swiss cheese. Damn it man put a decent cover on it so you can grill all fall and winter! Don’t tell me the snow is a factor either. Grills get hot. Heat melts snow. Get your grill on! Sure you may need to keep a shovel at the back door to shovel a path to the grill but that is a small price to pay to keep the taste of summer going all year long! Trust me it will warm your soul. Not just any grill cover will do. Oh no – it must be able to stand up to the elements all year long. If only there were some sort of outdoor fabric meant to stand up to the elements….let me think…Sunbrella! If you aren’t familiar with sunbrella fabric let me give you a quick introduction. It is made my Glen Raven Mills which has been making fabric and material since the ice cream cone debuted and Theodore Roosevelt was president in 1904. Sunbrella is a solution dyed acrylic fabric meant to be outside. It is widely used in the marine industry and outdoor living industry. It carries a 10 year warranty for goodness sakes! I think it will hold up quite nicely as an all year grill cover. 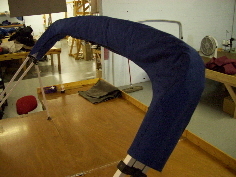 Sunbrella carries a wide range of colors. We use the marine grade sunbrella to make our grill covers and you can choose whichever color you want. In fact, choose two if you like. Pick a couple of colors to accent your home, or of your favorite sports team. We have a grill cover to fit your needs. If not we will custom build one for you. These are designed and made in Toledo, Ohio and we are sure you will love the way it looks, fits, and protects. I ordered a kids toy my daughter saw on a commercial while watching nickelodeon. It’s Christmas and she’s been good and it’s only 20.00 so I jumped online and ordered it. One less present to buy. Check it off the list. Two days later I receive a phone call from the company thanking me for the order. How nice, I think to myself as the person on the other end thanks me for my recent purchase. If only the call stopped there. They want to send me 100.00 in gas cards because of my purchase and sign me up for a savers program for just 1.00 for the first 14 days and then only 29.95 each month after. (Insert sarcasm). “No thanks, just send my order” is my reply. They assure me my order has been shipped but they need to verify my credit card for the savers program and free gas cards. “No thanks” and I hang up. The next day another call comes in from the same company with the same request. I tell them I don’t have a credit card with me and that I’ve maxed it out anyways. (Not entirely true, but close). They gave me a number to call them back when I can, to give them my credit card -which I won’t do. What I thought was going to be a pleasant experience turned into a terrible one with that first phone call to thank me for the order. If it had stopped there – with a thank you – I would have ordered another set for my niece but since it is only a front for some other savings program I decided against it. Being in a business that manufactures and sells products to consumers, I am always anxious to see how other companies handle customer service. This particular companies treatment of their customer – me – actually cost them a sale. At Northstar Products we try to create a relationship with our customers that emulate the relationship you have with a family member or close friend. We are happy to answer your questions about our products or refer you to another company if we can’t help you out. We want a company to do that for us as consumers as well. We treat our customers and potential customers the way we would want to be treated. There are a lot of places to buy canvas for your boat, especially with the internet involved. You can buy from anyone, but not everyone will go the extra lengths we are willing to go. Give us a call. Let’s talk about what you need and what you don’t need. Let’s put a good looking piece of canvas on your boat for a good price. Let’s turn some heads on the water and keep some money in your wallet. If your bimini top hasn’t faded in 5 years it probably won’t fade in another 5 years. 90% of all pontoon boats are 8′ wide. Wow…there were more great lines but to keep this from dragging on and on lets just leave it at these three. As someone that has been around different fabrics my whole life I can tell you the first line is a bit off. I was going to email the website and ask if they believed that statement will they give me a 10 year warranty on their 5 year fabric? 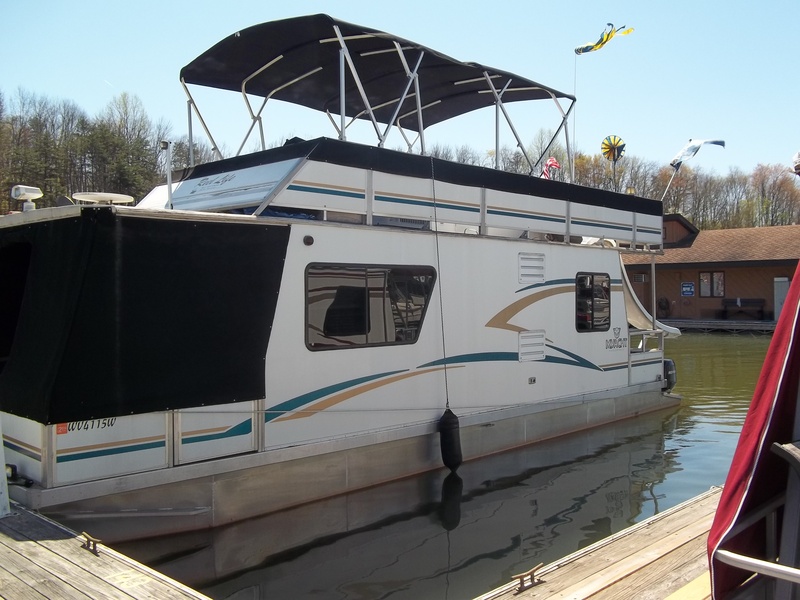 90% of all pontoon boats are 8′ wide. If it were the year 1999 I’d agree a little more but not completely. Most are 8’6″ wide in 2014. I have bought and sold quite a bit on ebay. I have never had the impression the seller was in a dorm room. I have never sold anything from a dorm room. As a consumer I feel a bit lost when it comes to who is saying what online. Bimini tops are not cheap. If I dig into this topic online far enough I am going to get more and more confused. I would want to call someone who can help. Call Northstar Products – we are here to help. We will answer all questions honestly. We won’t pressure you into upgrades or try to sell you something that may or may not fit correctly. Doing business with us is like doing business with a family member or friend. 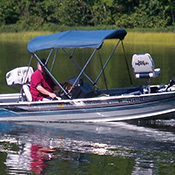 We will treat you fair and help you pick out the right top for you and your boat. We are not a one size fits all sort of business. If you want your bimini frame and top to be 92″ wide we are not going to make you buy an 8′ wide frame and push it into a 92″ wide boat. We will build it 92″ wide for you. No extra charge to do it either. Remember you are working with a friend here. Over the years we have listened to our customers and have brought out products that they want. We began with 1 fabric and 1 frame size. We have evolved into so much more. 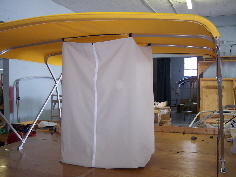 The most recent product we have been asked for is a high quality bimini top with a stainless steel frame. While our focus is always on quality we wanted to ensure we could offer a high quality bimini top with a stainless frame at a competitive price. What we have found out is there are a lot of opportunities for us to grow this new line given how expensive stainless frames with bimini tops seem to be. We currently offer a small stainless frame and bimini top that is 6′ long as well as one that is 7’6″ long that are used widely on small fiberglass runabout boats. The frames we are being asked for are much bigger – typically 90″ wide and 10′ long. Given how big they are we realized that cutting the frame for shipping is not an option. We were not comfortable with the way the frame performed after re-assembly given its size. We decided to look into keeping the frames uncut to send them out. What kind of cost will this have on our end product? What we have found out is even with shipping these frames via RL Carriers and charging the 150.00 – 250.00 to get them to their destination we are still coming in at a less expensive price with far higher quality item than is currently available. 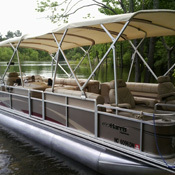 We install the bimini on the frame, put the boot on, wrap it in plastic, and box it up. When you get it all you have to do is open the box, install the hardware on your boat and put the bimini on. No assembly is required. If you take into consideration the amount of time you need to assemble a frame, and put a dollar amount on what your time is worth, this really isn’t very expensive at all. We can build stainless frames – with stainless fittings and deck mounts – from 6′ wide to 8’6″ wide. 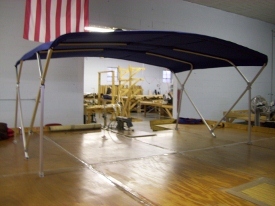 We can build them with bimini tops that range from 7′ long to 10′ long. We utilize three different fabrics with 3 different warranties to stay attractive in several price points. The tops and frames we produce pull out tight and will really breath new life into any boat. The tubing we use is 7/8″ 304 stainless. The same is true for the fittings, deck mounts, and fasteners we use. 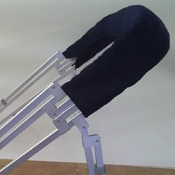 We typically build the frames with rear braces and font adjustable straps. All frames are 4 bows. The bimini tops we build utilize zippered pockets to easily take the bimini on and off the frame if the need arises. We use YKK or Lenzip zippers. Each corner of our bimni top utilizes a button that snaps to the frame to keep the top centered and pulled tight. We run all of the edges of our bimini tops through a surging machine to lock in the edge of the fabric to prevent fraying. We then use a color coordinated edging all the way around the perimeter to give it a custom finished look. The storage boot is always included. We go the extra steps to ensure the bimini top we make for you is exactly the way you want it and will hold up under the rigors of being on the water and in the elements. Its important to us because we are boaters too. One of the main core competencies of our company is asking ourselves “would I want this on my boat”? I believe your answer to that question will be “yes”. Give us a shot. You won’t be disappointed. Custom Bimini Tops. Made in the USA. One size does not fit all. I’ve seen a lot of Bimini tops for different kinds of boats that claim to fit 94-102″ wide – same top same frame. That doesn’t seem right to me. When you buy shoes you buy the size you need. You don’t buy a shoe that you may have to squeeze your foot into or so big you may walk right out of them. You buy the size you need. The price is the same if it is an 8 or an 11. 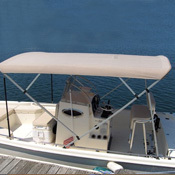 Why should your Bimini top for your boat be any different? You can buy the length and width you need and it won’t cost you a penny more. If your boat is 89″ wide and you want a double Bimini top but your front rails are 5″ lower than the back rails then you should be able to order a double Bimini too that is 89″ wide and accommodate a different rail height for no extra charge. With Northstar Products you can. We specialize in it. Custom Bimini tops for a basic price. Unmatched quality. The best part – ALL made in the USA! Try us- you’ll be amazed.